What Can Trigger High Blood Pressure and Heart Attack? It’s been considered completely safe pain and inflammation relief. Most people grab one once in a while but many take it on a daily basis not realizing that this can trigger high blood pressure and heart attack. Especially when suffering chronic pain. But evidence is mounting against the use of this popular pain relief medicine. And we may be looking at something similar to the Vioxx scandal, where as early as 2000 drug-makers and the FDA knew there were problems- but stayed quiet until it was banned in 2004 due to serious cardiac failure risk. A study published in the online version of the journal, Lancet, has implicated the popular pain remedy class Non-Steroidal Anti Inflammatory Drugs (NSAIDs) in a variety of dangerous side effects. 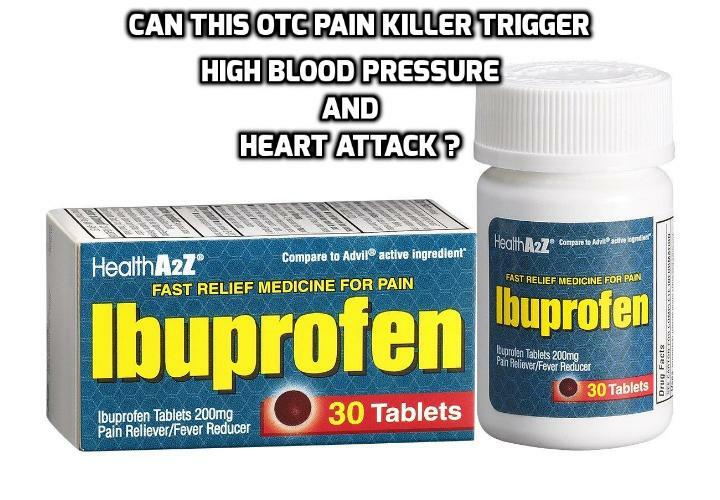 The shocking fact is this pain killer can trigger high blood pressure and heart attack. The study looked at the occurrence of significant health problems such as major vascular events, cause-specific mortality, and heart failure. It is already widely published that NSAIDs, most popularly ibuprofen, are responsible for gastrointestinal upset, leading even to ulcers, but the life-threatening side effects are only coming to light with studies published within the last year or so. What the researchers found was that people who use NSAIDs are more than 3 times as likely to suffer from major cardiac events, similar to what was seen with Vioxx, as those who do not take NSAIDs. This included heart attack and vascular events such as stroke and aneurysm. The study looked at people who used the over-the-counter pain remedies regularly, as you would for arthritis or other chronic pain conditions. The study also found that hospitalizations among NSAID users doubled compared to non-users. What does this mean for those who have come to depend upon ibuprofen or coxib-based drugs? It confirms what naturopaths and natural health researchers have been saying for years, which is that natural, drug-free solutions to pain management and elimination will always be safer than pharmaceutical-based approaches. Next PostNext How Best to Actually Cure Genetic High Blood Pressure?